The flu season is in full swing right now and taking its toll on many. I was on the CDC’s (Centers For Disease Control & Prevention) website looking at statistics for this year’s flu season. It’s now reached an epidemic level due to the number of deaths from flu and pneumonia related illnesses, many of them children. So what can you do to keep you and your family safe? Beyond getting vaccinated, avoid people who are sick, wash your hands often, get plenty of sleep, reduce stress, drink lots of water and eat nutritious food. Eating the right foods is vital for a strong immune system. Here are nine powerhouse foods when it comes to boosting your immunity. You’ll see I not only listed the food (in green) but the reason why it’s so powerful as well (in pink). 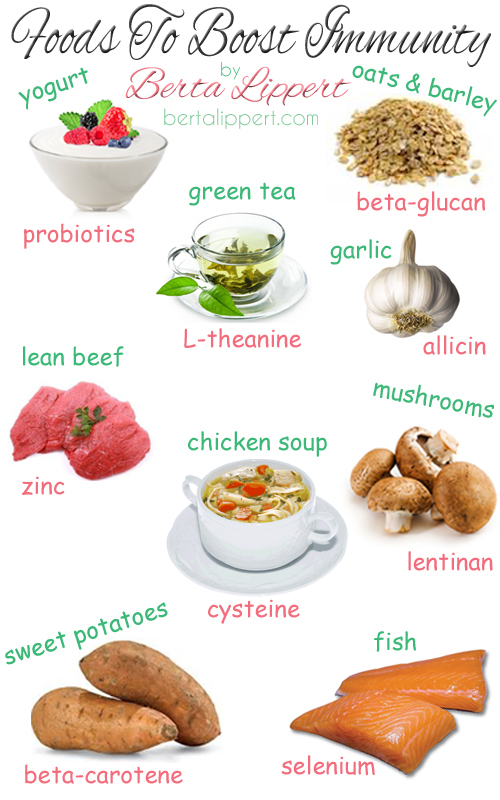 Be sure to include these foods in your diet for a healthy, strong immune system. If you’re on Pinterest/Facebook, please share &/or pin this image to help others. For additional guidance on preventing the flu, check out the CDC’s FREE Resources on their website here.